DAZ Depth of Field Settings- A General Starting Point? but I was struggling to put it together because of the organization of it. People asking questions made the information jump around too much for me to grasp it. Can you see if I've got the concept/ how-to correct so far? 1 First, DOF settings are in the camera setting, and it was mentioned to use a second camera to see the camera using the DOF- is that correct? Let's call that second camera Camera 2, and the first with the depth of field the DOF camera. I have not found information on b and c, so far as settings to get me in the ballpark, and I must not be using the cameras right (the basics) as I'm literally not seeing any change whatsoever when spot rendering- so after trying it for an hour I'm admitting the "I'm stuck" factor. Thanks in advance. You have 1 and 2 correct for the most part. Keep in mind that with DOF on, there are two planes...one for the front (everything in front of this plane will be more out of focus) and one for the back (everything behind this plane will be more out of focus). Different people might have different advice about point 3...I'd suggest you start with the default value for focal length (65) and f/stop (22) and adjust focal distance. Once you're familiar with how focal distance works, then move on to f/stop, and finally focal length. For 3b...I don't think this is really possible with depth of field, unless the elements at the edges are closer to the camera than the main subject (or further from it). You could do it in postwork, though. For 3c, you'd just decrease focal distance in order to move that front plane away from the person's nose until it reaches the foreground objects. And you'll probably have to increase your f/stop (expanding the area between the front and rear DOF plane) to keep the person in focus. There are other methods which would involve adjusting the focal length. Personally I prefer to do full test renders (if you need more speed, adjust shading rate and/or turn off the lights, or hide the hair) instead of spot renders. I like to see the full frame. I'm not an expert in depth of field, but hopefully this is enough to move you past being stuck! Let me know if you have any questions. Edited to add: one more important thing...the position of the camera has a huge impact on how DOF works, which is why you can't really plug in a set of values taken from one scene and expect the same results in a different scene. If you Load Both Cameras as you have been doing and LOOK real close there is a FOCUS mark on the DOF depth line (the long one from the center of the DOF camera). As you change The Depth (Spread the Planes) it should Show as an X on that line. That is what you place on your main Figure to get the fully in Focus for it part. Then as Scott points out Items Before the Front Plane and up to the X will have the Proper DOF and items behind the Rear Plane and behind the X will also have the proper DOF. F-stop the lower the numbers the more blurry and higher the number the less blurry before and betond the DOF focal point Jad explains above. Also the lower the f-stop the more blurry the more you need to increase Pixel Samples X and Y in the Advanced Render settings as explained in post two of your first link above. Ditto. It lets you have a look at the total composition of the scene (and what is casting shadows on what, etc. Spot renders are great if you're really concentrating on tweaking a material setting or checking a possible geometry error. Again, though, he's right; go with what works for you to get your best results. The center between the DOF planes is a white ball. I usually try to "hide" that right in the center of the intended focus area to bring the other two planes more or less where I want them with the focal length slider. Then I use fstop from there. Here's something they don't tell you anywhere about the DS Camera. It's actually a Large Format Camera and the default setting of F-22 is actually closer to a minimum (smallest focal range) realistic focal range with F-32 or F-45 being more the median in terms of realistic photographic depth of field. Sikeus- I had to giggle when I read your post- I am so used to clicking and dragging objects, there have been MANY times when I find myself clicking and dragging on an object and then thought, "Shoot, I have to either click on that Universal Tool cube or get over in the Parameters tab sliders, you idiot!" I'm just so used to click and drag that I forget the viewing pane doesn't work that way. 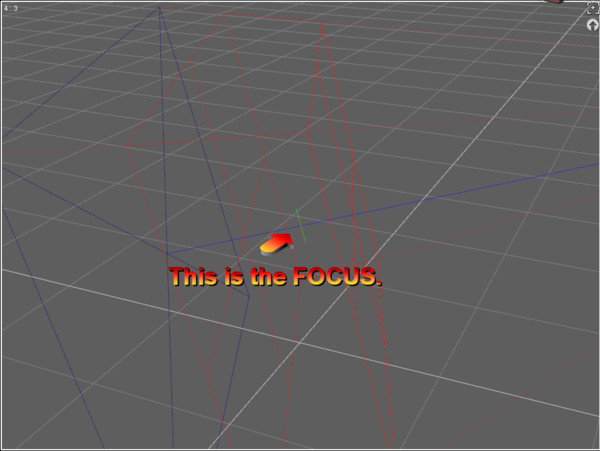 Wouldn't it be nice to have that for DOF and the objects?!! HINT HINT FOR THE NEXT EDITION OF THE STUDIO! A la contrare- if I spelled that right, lol- in the Meet The Daz Team Youtube video, the CEO said he monitors the forums. So there's hope! BAW!! HA! HA! HA!! Um... from time to time and at random. I'm a CV and do not mind saying this. The Forums are us Users 99.9999999999999% of the time. Seriously...No disrespect but this has got to be the most easiest things to set up in Daz Studio. Use the perspective camera to view the DOF Panes and Focal point...You even have a toggle to turn on the DOF planes so you can see then when viewing through the camera itself, Back and front. Sorry I know you are new but seriosuly this is one of the easier things to set up in Daz Studio. Sorry about that above, having a bad day again. What I am trying to say without belittleing anyone (hich was not my intention above) is that setting up where your focus point is, is really easy. Select your rendering camera in the Scene Pane then use the Perspective, Top and load another camera to look at where the focal point is, what Jaderial showed you, you should not have any trouble setting up that aspect of DOF. Getting the F-stop set up is another matter but that only relates to how much blur takes place before and beyond the DOF planes but this also depends on how close other objects are to the main subject. The further or closer they are the more blurred they get. You can offset this by choosing a high F-stop Value or by using a longer lens (Focal Length)camera to make the space between the DOF planes wider. lowering the camera lens will make the space between the DOF planes smaller. Szark, don't worry about it! I just haven't replied because we are dealing with tornadic thunderstorms all day today and I have had to monitor supercells, etc in case I was needed at the ranch. I am busy doing other things besides that, so just had not read the forum or been online. I know that you meant it to be encouraging, and if I have problems, you'll steer me the right way. :) I've done "dumb" things before, Scott-Livingston can attest to that, as when I was reading his geometry shell tutorial and was trying to work in the content tab instead of (what was CLEARLY explained) the surfaces tab. So wouldn't be the first time I did a "duh", but the important thing is I'm a determined "duh-er" and don't give up easily. Wow. I've done everything you mentioned above except going into the top view on the perspective camera, and that made all the difference. I was able to grab the round ball and cube and manipulate the planes to my heart's content, and it was so much easier! I'd been trying to use the sliders in the camera pane under DOF, and it didn't work well. Now I'm starting to understand that the ball/x wasn't centered on my character, so of course I couldn't get the planes in the right place. Thanks for taking the time to share your knowledge despite your frustration at my newbie-ness! You'll find it's easy once the procrastination part is over. :) Love the picture! Here's what I did. 1) Added a camera to my scene. 2) Went to the camera tab, turned on DOF. 2.5) Went to scene tab and clicked on my camera. Very important, else you won't be able to see the pretty white lines that tell you where your planes are. 3) Switched back to perspective view. 4) Used perspective view to look at the top of my character's head. This is very important. It makes things so much easier! 5) Found a small gray sphere with a little red line in it. Clicked on it with my mouse and dragged it to the center of my character's head. This changes the focal distance, if we're using proper terms. 6) Still looking at this from the top view, Click on the gray box directly to the right of the gray sphere. While holding down that click, move your mouse forward and backwards. This makes the distance between the DOF planes deeper or skinnier around the center sphere. 7) The last thing to play around with is the gray cube between your character and the camera. Click on it, move it back and forth. This makes the DOF planes bigger while increasing/decreasing the distance between the planes. 8) Play with all three items, the sphere and two cubes, to get the effect you want. Will maybe get a chance to try it tonight or tomorrow. What scene are you trying it on? A closeup person, or an entire scene? Mine is a forest with three characters, but most the background is dark anyway. If you have the time trawl through my brief outline on composition, you might find you don't need DOF if your subject/s are ligther than the background and forground objects. DOF and Contrast (between light and dark) can have the same effect as each other drawing to eye to where you want. DOF is good when you don't have that contrast. I am not saying you can't as this is art and it is entirely up to you what you do with your image, I would never tell anyone not to do something. Here's a quick scene I threw together in a few minutes to test DOF. It's definitely not a fantastic picture. But I have DOF! Edit: the DOF is more noticeable when you click on the picture and see the original size. The wood grain on the tower she's leaning against is quite detailed in the original prop, so there's definitely some blurring going on. I can actually tell because the hand is blurred too. :) The DOF really adds a nice touch, glad it's working out for you. I'm really glad I found this discussion! I have never used DOF until I happened to purchase "Wild Borders" by Merlin. Everything worked great UNTIL I added a figure to the scene and when I rendered it, the figure was out of focus, but the fence and flowers behind her were in focus. Looking at the camera I realized it had DOF turned on but I had no idea how to change anything. Thanks to this thread I have an idea of what I am supposed to be doing now. I did a test render of my scene and I like the general effect. Glad you figured it out! It's been two years since I first posted that and I was tickled to see it's helping a lot of people. DOF makes such a difference in the renders! Hopefully if anyone else is new to it, they'll spot the thread and ask for help.